As you can see from the photo, my kitchen counter top is less than forgiving if anything should hit it, especially glass. So, on Monday, as I was making coffee, the carafe hit the edge of the counter and smashed. Oh, yes... I was naturally concerned for the pieces of glass that might end up in my dogs paws, or kids' bare feet or the blood that was dripping off my thumb... BUT THAT CAN WAIT, OK??? I needed a cup of coffee first. It's amazing how a little vacuuming and cleaning in the morning (hey, anytime... who knew?) could get those creative juices flowing! 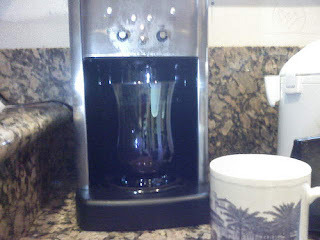 So, since Monday my efforts to make sure I get a few sips of coffee into my caffeine-deprived body every morning have grown from merely hanging my head below the spigot of the coffee pot while it drips (a little hot but you can avoid blisters if you coat your lips with Vaseline first) to using a flower vase as the carafe. The picture you see here is the vase from Valentine's Day in the coffee pot. What a thoughtful Valentine's Day present, huh? And so, my new carafe (which was ordered 22 seconds after the "incident" of which we shall never speak again) should arrive early this week. My next task will be to put rubber padding on the kitchen counters. Why would I want to take chance like that again?